TOP QUALITY UPSCALE MODEL ST. NICK TODDLER SLEIGH IN FESTIVE COLORS. BEAUTIFUL HAND-CRAFTED WOOD WORKING IS THE CENTER PIECE OF THIS SLEIGH, ITS' WIDE RUNNERS WITH DELICIOUS CURVES CREATE LESS DRAG AND PROVIDE BETTER PERFORMANCE IN SOFT SNOW. 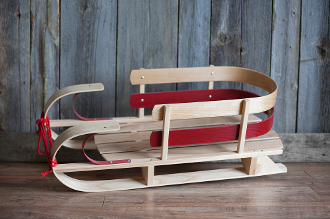 ST. NICK TODDLER SLEIGH AS SEEN IN THE SKI RESORTS LIKE WHISTLER BLACKCOMB AND MT. TREMBLANT. PULL CORD INCLUDED.